Northern Tablelands MP Adam Marshall, left, Runner-up in the Australian Apprentice of the Year Courtney Harrison and Deputy Premier and Minister for Skills John Barilaro pictured in September. MEMBER for Northern Tablelands Adam Marshall today congratulated Inverell-based Light Vehicle Technician Courtney Harrison on her achievement in being named runner-up Australian Apprentice of the Year at the National Training Awards last night in Darwin. 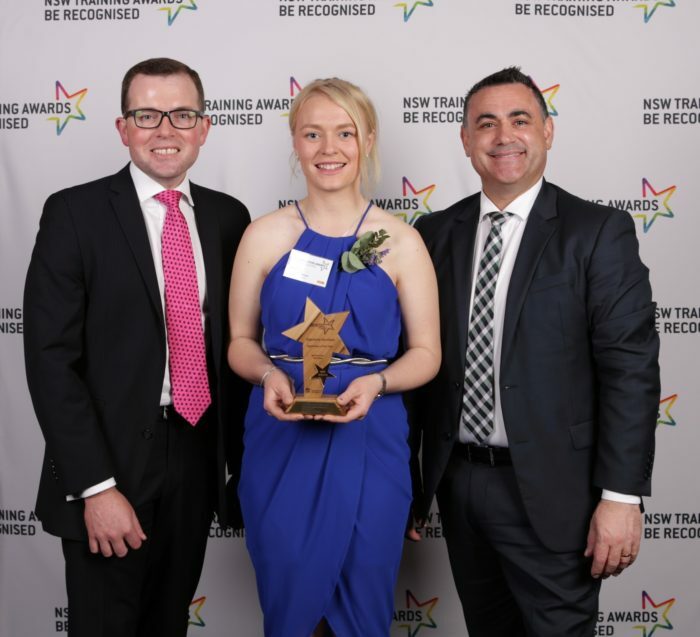 In September Courtney took out the NSW Apprentice of the Year award which Mr Marshall said put the spotlight on the fantastic training opportunities available in the Northern Tablelands and throughout the State. “Courtney has done herself, her family and Inverell proud and I’m delighted she’s taken again proven herself, now as the second best apprentice in the whole country,” Mr Marshall said. “This is an unprecedented result for an apprentice from our region. “Her achievement reflects the passion and commitment she has invested in her studies with TAFE NSW New England Institute and in her apprenticeship with local employer Dieselquip. “Courtney is one of a growing cohort of fantastic young women who are not afraid to pursue a role in a traditionally male trade. “She recently completed her full apprenticeship after beginning her automotive career back in 2011 as a School Based Apprentice. Deputy Premier and Minister for Skills John Barilaro said vocational education and training in NSW was a fantastic pathway to a job across so many industries, for people of all ages and from all backgrounds. He added his congratulations to Courtney and hoped that it served to inspire others to achieve their potential. “From retail to engineering and training for people with a disability, there’s never been a better time to learn new skills in NSW,” Mr Barilaro said.